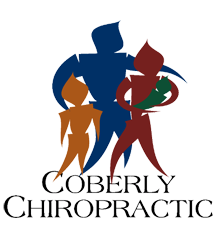 Office Ergonomics – Coberly Chiropractic, Inc. The Office Chair: The height should be adjusted so that your thighs are parallel with the floor and knees at a 90 degree angle. Your feet should be flat on the floor or elevated with a small support. There should be space between the front of the chair and the underside of your knees to avoid pressure on nerves and blood vessels in the back of the knee. Armrests should be adjusted so that forearms are parallel with the floor. Backrest should be adjusted so that it is slightly reclined, fits snug, and is comfortable against the lower back supporting the natural lumbar curvature. The Monitor: It should be at or below eye level and about an arm’s length away. The lighting and brightness should be adjusted to reduce eyestrain and glare. Monitors with matte as opposed to glossy finishes are better in an office environment due to less glare. The Keyboard: Your keyboard should be close enough that you don’t have to reach and at a level that allows the forearms to remain parallel with the floor. Ideally your elbows should remain at your side directly below your shoulders. Wrists should remain straight, not flexed or extended. Wrist rests or pads should be avoided due to pressure placed on the nerves and blood vessels in the wrist. The Mouse: As with the keyboard, the mouse should remain close enough that you don’t have to reach. Repetitively reaching for the mouse will result in shoulder and neck problems over time. Again, the wrist should remain straight, not flexed or extended. Documents: Use a document holder that is the same distance and height as the monitor if you are transferring information from paper to computer. Desk Accessories: Organize frequently used accessories within close reach to avoid excessive reaching and twisting. Phone: Avoid cradling the phone between your neck and shoulder; instead use a headset. It allows you to work hands-free and protects the sensitive nerves and joints in the neck and shoulder. 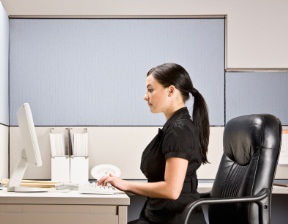 Ensuring that your workstation is properly set up will reduce fatigue, discomfort and missed work days. It will make work more enjoyable, improve the quality of your work and most of all help keep you healthy. However, sitting at a desk all day is not how your body was designed to be used. Movement is essential, so take short stretch breaks at least once every hour. Movement is like WD-40 for your joints. Also, your eyes can become fatigued from staring at the monitor for hours on end. Follow the 20/20/20 rule to reduce eye strain: Every 20 minutes focus on objects about 20 feet away for 20 seconds. Following all the recommendations above will certainly improve your quality of life at work. However, healthy habits start at home. In order for you to be healthy at work and home, you must live a healthy lifestyle. Strive for 7-9 hours of sleep every night, eat a healthy diet, exercise, and drink plenty of water.